는 조선시대 공물과 세금 등의 경제를 담당하던 호조 관리들의 계회모임을 그린 것으로, 비단바탕에 가로 59㎝, 세로 121㎝이다. 보통 계회도의 상단에는 모임의 명칭이 쓰여져 있는데 이 그림은 명칭이 빠져있다. 참석자들은 안홍·이지신·김익 등으로 의관을 바르게 하고 안쪽 가운데 인물을 중심으로 좌우로 둥그렇게 앉아 있는데, 안쪽에서 멀어질수록 인물들을 작게 표현함으로 계원들의 서열을 나타내었다. 명종 5년(1550)경에 그려진 이 그림은 산수배경을 위주로 했던 16세기 중엽 이전의 계회도와는 달리 계회장면이 산수배경 못지 않게 부각되는 등 전통을 따르면서도 16세기 중엽의 큰 변화를 반영하고 있다. 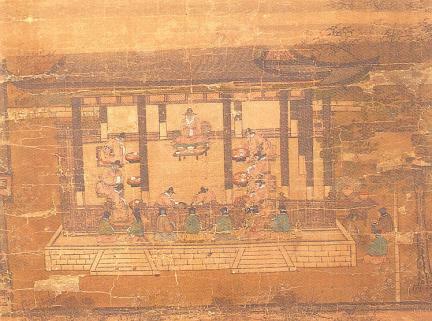 Hojo nanggwan gyehoedo (Gathering of Fiscal Officials) depicts a meeting of the government officials from Hojo, the Ministry of Finance, who took charge of the tribute and tax. Drawn on silk, it measures 59 centimeters wide and 121 centimeters long. The name of the meeting is usually written on the upper side of this kind of paintings; in this painting, however, the meeting’s name is omitted. 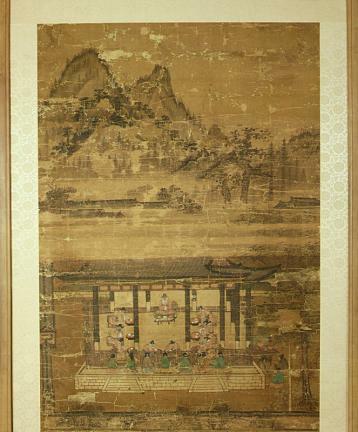 Nonetheless, the personal information written at the bottom suggests that this painting is about the meeting of the former and present officials of the Ministry of Finance, and that it was made around 1550 (fifth year of the reign of King Myeongjong of the Joseon Dynasty). The participants were An Hong, Yi Ji-sin, and Kim Ik. Decently dressed, they are sitting around the person at the center but in order of importance; the further from the inside, the smaller, and consequently less important, the figures appeared. 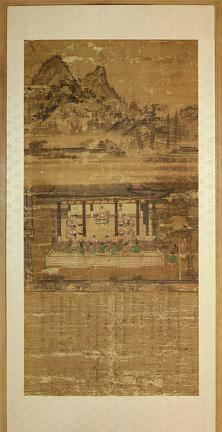 Whereas this kind of gyehoedo (painting of the gathering of officials) produced before the mid-16th century briefly described the meeting scene and focused on the natural landscape around it, this painting displays different characteristics, with the scene of the meeting highlighted as much as its background. Therefore, it follows the former tradition but also reflects the changes in the mid-16th century.